Since 9/11 the politics of prediction and risk have created an alliance between security agencies, technology firms and other commercial actors which seeks to create a precrime assemblage: the first generation sought to identify threats through data mining (“search habits, financial transactions, credit card purchases, travel history, and email communications”) but the next generation are “becoming intelligent assemblages capable of integrating data from a multitude of nodes in order to foresee and preempt harmful futures” (pg 2). These advances are being facilitated through cloud computing, machine learning and limitless storage. The beta versions of these assemblages are being tested in real world situations, rendering it urgent for us to understand their implications. The first is what it means for criminal justice as a whole when the focus is on the anticipation of crime rather than dealing with its occurrence after the fact. The second is the expansion of surveillance into everyday life driven by the public-private alliances which are driving the agenda. The scope of surveillance is increasing but so too is to civic participation in it, driven by gamified mechanisms which “encourages citizens to do the securitization footwork of the state by offering them the opportunity to participate in do-it-yourself, reward-centered, pro-active, networked and, at times, and gamified versions of automated governance” (pg 2). Peter Mantello argues that the allure of technological innovation is legitimating these developments, promising greater impartiality and efficiency, while the reality of their operation is extending juridicial reach in order to identify non immediate threats to the established order. The pre-crime assemblage will function “to preserve the domains of its masters, who will control immense existential and predictive data that will allow them to shape public perceptions, mold social behavior, and quell possible opposition, thereby ensuring the exception incontrovertible and infinite life” (pg 2). He uses Massumi’s conception of ontopower to theorise this process, “a mode of power driven by an operative logic of preemption is spreading throughout the various structures, systems, and processes of modern life” (pg 3). Pre-emption itself is long standing but the preoccupation with speculative feelings of non imminent threats was, he argues, born out of the reaction to 9/11. If I understand correctly, the point is that risks are increasingly pre-empted rather than managed, with risk management becoming an anticipatory lens through actors and organisations proactively prepare for imagined futures. Exceptionalism becomes legitimate under these circumstances, as anticipated threats are used to justify actions which would have otherwise been regarded as illegitimate. A mechanism like the “public safety orders” enacted by the New South Wale police expand the principle of anti-terror policing to civic law enforcement: “they shift the balance further away from the principles of due process where people are innocent until proven guilty and more toward a new era where crimes are committed before they happen, citizens are disappeared without recourse to defense, and where guilt and imprisonment are based on suspicion, rumor, association, or simply left to the intuitive ‘gut feeling’ of police officers” (pg 4). This goes hand-in-hand with an affirmation of the unpredictability of the future. Randomness and uncertainty mean that crimes cannot be avoided but this is why anticipatory work is seen as so important to minimise the threats on the horizon. This includes mining data from an array of various nodes such as remote video systems (hotels/city streets/commercial and private properties/transporta- tion lines), gunshot sensors that alert CCTV cameras, vehicle license plate recognition systems, wireless com- munications, Twitter and other social media, mobile surveillance systems as well as useful data from smart parking meters, public transit systems, and online newspapers and weather forecasts. Data visualisation plays a crucial role in this by “compressing vast amounts of invisible data into visible signifiers” (pg 5). However the uncertainty, ambiguity and construction which characterises the data itself is lost in the apparent self-evidence of the ensuing representations. The navigability, scalability, and tactility of the interface then mediates interaction with this experienced reality. The performative power falls away, as diverting police resources to ‘hotspots’ only to discover ‘more crime’ there (either comparable to what could be found elsewhere or encouraged by the aggravating factor of heavy handed police) comes to function as a legitimation of the apparatus itself. The approach also compounds existing inequalities through its reliance on historical apparatus about patterns of arrest in order to predict future offending. What I found fascinating was the slippage in the software. An example on pg 6 concerns ‘at risk’ lists, intended to be the basis for social service interventions prior to any policing action, instead being used as target lists for people who were assumed to be likely offenders. This on the ground slippage highlights the importance of understanding the organisational context within which new tools are deployed, as a means to understand how their original intentions may mutate in the context of application. The gamified form this takes can be seen in Sesame Credit, produced in collaboration with Alibaba, as part of the early stages of China’s opt in social credit system, with rewards on offer for those who perform in ways that meet expectations. But as this becomes mandatory in 2020, we can expect this to go hand-in-hand with the proactive avoidance of people deemed to have poor social credit and potential sites where negative social credit behaviours may thrive. The author also considers the example of opt-in blackboxes in cars, where rewards on offer for those who agree to such monitoring but which eventually may be rolled out for everyone as part of a transformation of insurance. The City of Boston security app, Citizen Connect, offers ‘street cred’ recognition points for repeated contributions: “users who actively report on suspicious persons, ongoing crime, random acts of violence, or municipal infrastructure hazards get promoted to special ‘‘patrols’’ where they earn special badges of civic distinction” (pg 9). Inevitably that conceptual subversion finds its way home, along with the technology that enables officials to promote comfortable illusions about surgical killing and nonintrusive surveillance. Take, for instance, the Holy Grail of drone persistence, a capability that the United States has been pursuing forever. The goal is to deploy solar-powered drones that can loiter in the air for weeks without coming down. Once you can do that, and you put any typical signals-collection device on the bottom of it to monitor, unblinkingly, the emanations of, for example, the different network addresses of every laptop, smartphone, and iPod, you know not just where a particular device is in what city, but you know what apartment each device lives in, where it goes at any particular time, and by what route. Once you know the devices, you know their owners. When you start doing this over several cities, you’re tracking the movements not just of individuals but of whole populations. By preying on the modern necessity to stay connected, governments can reduce our dignity to something like that of tagged animals, the primary difference being that we paid for the tags and they’re in our pockets. It sounds like fantasist paranoia, but on the technical level it’s so trivial to implement that I cannot imagine a future in which it won’t be attempted. It will be limited to the war zones at first, in accordance with our customs, but surveillance technology has a tendency to follow us home. The basic claim here is one we should take seriously: if technically feasible means of surveillance aren’t challenged, we face an inevitable slide towards their introduction. What currently exists within states of exception (a category that can range from war zones to mega-events) risks expanding into the everyday. How the introduction of techniques to areas outside normality is responded to will prove crucial for determining the contours of the new normal. I just came across this remarkable estimate in an Economist feature on surveillance. I knew digitalisation made surveillance cheaper but I didn’t realise quite how much cheaper. How much of the creeping authoritarianism which characterises the contemporary national security apparatus in the UK and US is driven by a familiar impulse towards efficiency? The agencies not only do more, they also spend less. According to Mr Schneier, to deploy agents on a tail costs $175,000 a month because it takes a lot of manpower. To put a GPS receiver in someone’s car takes $150 a month. But to tag a target’s mobile phone, with the help of a phone company, costs only $30 a month. And whereas paper records soon become unmanageable, electronic storage is so cheap that the agencies can afford to hang on to a lot of data that may one day come in useful. Yesterday I walked to the supermarket, like I do every Tuesday morning. All of a sudden I started noticing a few people starting to follow me. I try to convince myself that it is probably just my imagination, and carry on walking. After a few minutes, I cross the road and make another turn, but then I look behind me and see that now there are dozens of people starting to follow me, taking pictures of me and writing rapidly, documenting my every move. After a couple more steps, they became hundreds. My heart was racing, I could hardly breathe, and I started to panic. Freaking out, I shouted at them, “Who are you? What do you want from me?” I tried to get a clearer view of this huge group – some looked a bit familiar but I didn’t remember where I’d seen them before. They shouted back at me, “Don’t worry, we don’t really know who you are, we just need some information on you, so we can show you different ads on billboards”. Puzzled by their response I scream, “What do you mean you don’t know who I am!? You know my gender, skin/eyes/hair color, height, weight, where I live, the clothes and glasses I wear, that I have 10 piercing in one ear and that I shop at Sainsbury on Tuesday mornings!” They smile and try to reassure me, “But we don’t know your NAME, silly! So stop being so paranoid, we do this to everyone walking on the street, it’s public space you know…”. This scenario might seem science fiction to some people, a dystopian reality, horror film or a South Park episode. But for the others that recognise this situation, this is actually what happens every day when you browse the internet. This great lecture by Frank Pasquale (podcast) references this note, the text of which is the title to this post, sent to Martin Luther King by the FBI. As Pasquale notes, King was under constant surveillance that both facilitated and motivated this horrendous intervention. Can we imagine a data-driven generalisation of this condition and the possibility of comparable interventions being made by intelligence and security agencies seeking to repress dissent in an era of increasing social unrest? I certainly can. Present it as a technology for ensuring services are “as individual as you are”. 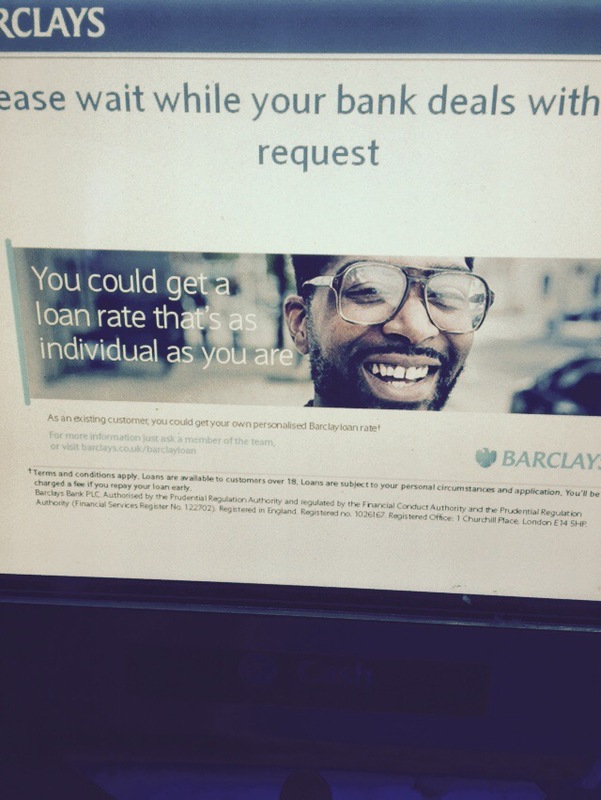 I don’t think this Barclays advert is selling surveillance but I think their advertising strategy is something we will begin to see ever more of in coming years. Reflecting their student populations, universities have long been bastions of oodles of consumer technology. We are awash in mobile phones, laptops, tablets, gaming consoles, and the like. If one combines mobile consumer technology with Big Data analytics, one gets a host of new possibilities ranging from new ways of providing students with basic support to new ways of getting students to learn what the faculty needs them to learn. If we can get the right information flowing through the minds of students, perhaps we can improve their success. We can potentially help transform the classroom from the 19th century to the 21st. The byproducts of all this data are the new insights that can drive decision making in new ways. When one adds into the mix advanced data visualization capabilities, one gets something different for university administrators and faculty: better and approachable insight into university operations and even the minds of the students. Higher education is at the cusp of gathering an unprecedented amount of information using affordable tools and techniques. I included some material on this in a lecture on big data I did for the MA course I was convening this year. But it just struck me how enormously significant this is for digital scholarship: the more academics embrace social media in circumstances where managers seek to unleash a big data tsunami of change, the more they will be monitored as part of such initiatives.